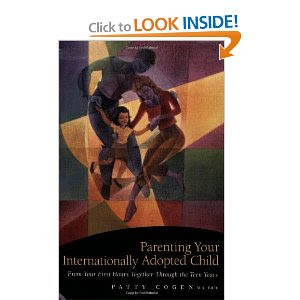 Parenting Your Internationally Adopted Child by Patty Cogen. It was recommended to me by several other adoptive parents and I am grateful. It has been an invaluable resource to us. I highly recommend it! I read about this on the Happy Girl Hair blog and it has been a lifesaver for us. The testimonial on the blog says it combs through tangles like butter and let me tell you, it is true. No more tears after bath time. Hooray! it is a great book! i have worn mine out. uh, I am sooo getting a tangle tamer! Thanks for the tip! Where did you order this brush??? I can only find UK sites! sarah, i ordered it through the website so it was sent from the UK. if i remember correctly, the shipping wasn't nearly as expensive as one might expect. i did some online searching to see if there were any US companies that carried it, but i didn't find any. Off to buy the book as well. We also dig the Cogen book (so many practical tips!) and the tangle teaser (M still fusses and shouts when we do anything to his hair, but at least I can tell it's not pulling on tangles and hurting him). Love Love LOVE the picture of Indigo! I'm also checking out that brush! And, Jude? He's got a future in photography for SURE! Love that you let him use the camera!